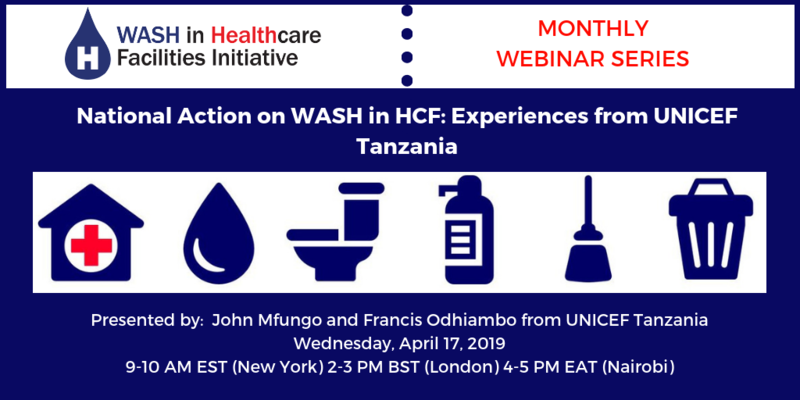 The next WASH in Healthcare Facilities Initiative webinar, entitled “National Action on WASH in HCF: Experiences from UNICEF Tanzania will take place on Wednesday, April 17th at 9:00am EDT. Click here to see the event in your time zone. Register herefor this webinar, powered by Zoom. After registering, you will receive a confirmation email containing information about how to join the webinar. If you know of others in the WASH or health community who would be interested in joining, please feel free to share the flyer attached! If this is your first time attending this webinar series, we suggest watching a short presentation prior to joining, which provides a brief introduction to WASH in healthcare facilities.